If you are looking for customized mobile electrostatic welding fume extractor made in China from a professional industrial electrostatic precipitator for welding fume airflow 1200cmh factory, please feel free to contact us. 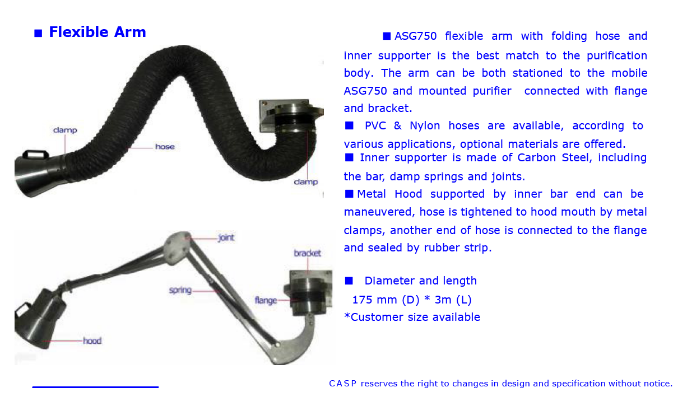 Note: ASG750 electrostatic precipitator can be used for welding fume extracting. CASP's ASG750 Fume Extractor is a professionally designed and well produced filtration/purification unit, which requires no filtration media replacement". The extractor features tri-step filtration/purification，first a metal mesh pre-filtrating the big size contamination; Second a master purification unit ionizing and collecting micro-particles with minimum size 0.01 M and the max efficiency 99.9%; third an active carbon filtration as the odor-eliminator. Air flow is sucked by the single-Phase turbo fan built-in. 2nd Electric field combining ionizer(12kv) & collector (6kv), collecting particles with min size 0.01 m.
Casings are constructed of high-quality mild steel and powder-coated (custom colors available). A high-quality fan is rationally combined; 6-foot/10-foot flexible extraction arms are available. The ASG750 also includes the motor, circuit-breaker, motor cut-out, electric parts and 18 feet of cable with plug. ASG750 is perfect for extracting fumes, welding, gases, and light, dry dusts. Applications include chemical, pharmacy, metal-processing and other contaminating area. The mobile ASG750 with four solid casters is easy to move, repair and other temporary work around the shop or to bring with on service. While the wall or giant machine mounted ASG750 is easy to install and fix on the wall or frame, custom designs according to different working situations and applications are available.